Take a minute to think about everything you’ve done in the past eleven weeks, going right back to the start of July. 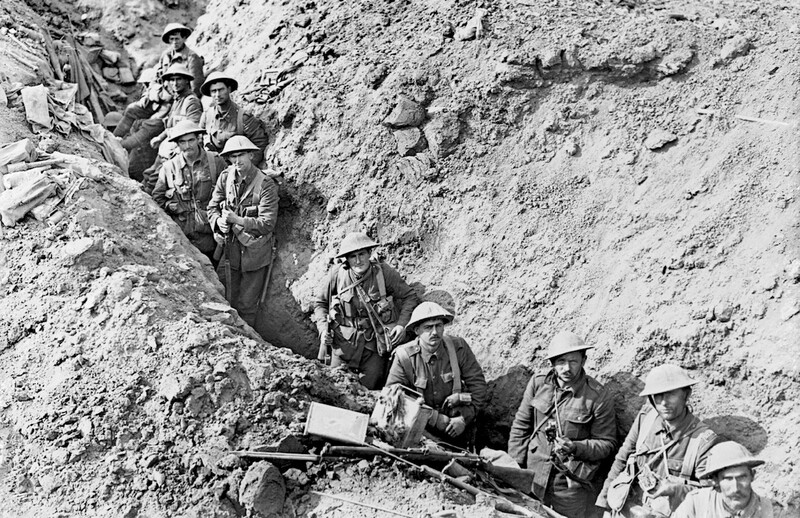 Now – how long does it feel since I posted this article to mark the first day of the Battle of the Somme? The thing is, by remembering the particular carnage of July 1st, 1916 we tend to forget about all the deadly trench assaults, redoubt sieges and air battles that were fought over the 77 endless days and nights since. And this is only half-way. The fulcrum. September 15th, 1916 was an extraordinary day and an ordinary day. 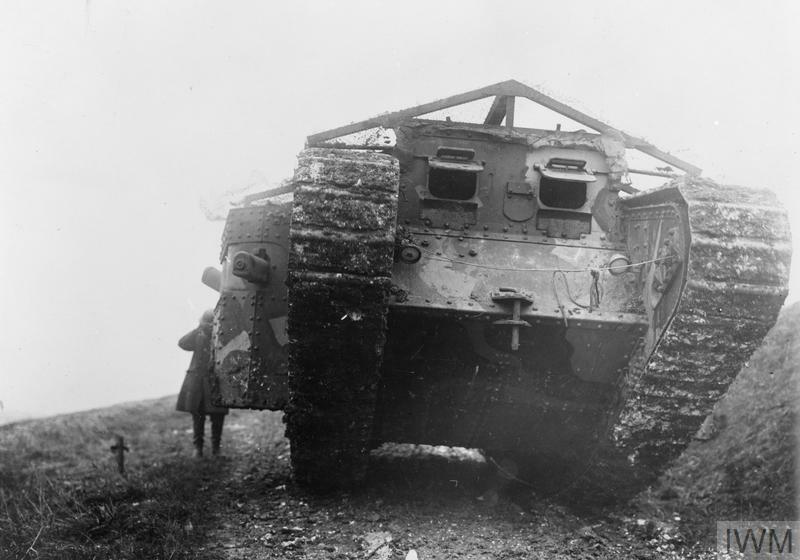 It was the start of a battle-within-the-battle now remembered as ‘Flers-Courcelette’, that saw the first-ever use of tanks in war. The day was also the first time the sons of Canada and New Zealand fought on the Somme. And it would finally see allied forces take and hold the high ground they’d hoped to capture way back in that first week of July. The air war was at a pivot-point too. 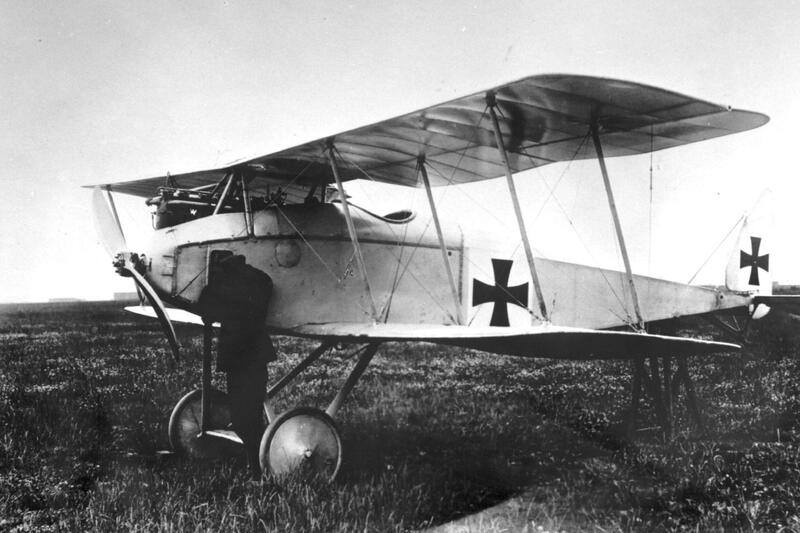 Tomorrow morning, September 16th, Oswald Boelcke and the battle-hungry pilots of his freshly formed Jasta 2 would receive five new Albatros I fighters and an Albatros DII. 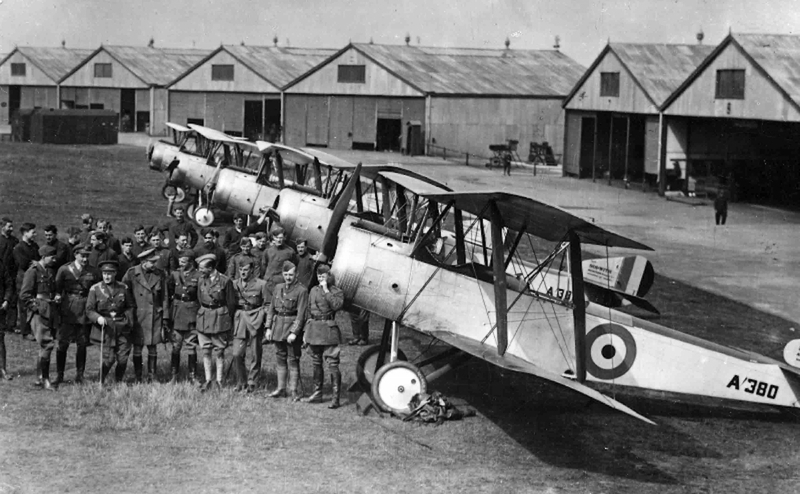 By that afternoon they would have them in action, tearing apart the air superiority Hugh Trenchard and his men and been fighting to win and maintain since March. An orderly called me at 4.15 a.m. for the big offensive patrol. The sky was a dark grey curtain decorated by faintly twinkling stars. 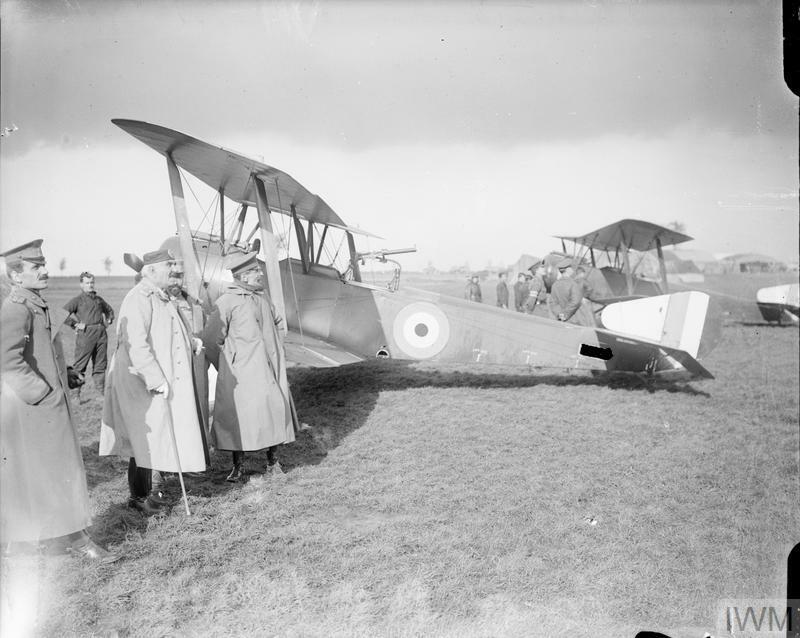 I dressed to the thunderous accompaniment of the guns, warmed myself with a cup of hot cocoa, donned flying kit, and hurried to the aerodrome. There we gathered around C, the patrol leader, who gave us final instructions about the method of attack. We tested our guns and climbed into the machines. By now the east had turned to a light grey with pink smudges from the forefinger of sunrise. Punctually at five o’clock the order, ‘Start up!’ passed down the long line of machines. The flight commander’s engine began a loud metallic roar, then softened as it was throttled down. 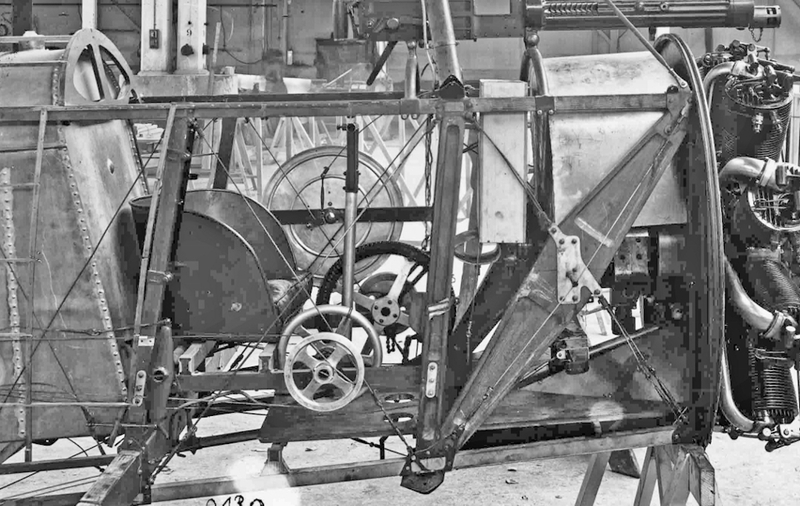 The pilot waved his hand, the chocks were pulled from under the wheels, and the machine moved forward. The throttle was again opened full out as the bus raced into the wind until flying speed had been attained, when it skimmed gently from the ground. We followed, and carried out the rendezvous at 3,000 feet. The morning light increased every minute, and the grey of the sky was merging into blue. The faint, hovering ground-mist was not sufficient to screen our landmarks. The country below was a shadowy patchwork of coloured pieces. The woods, fantastic shapes of dark green, stood out strongly from the mosaic of brown and green fields. The pattern was divided and subdivided by the straight, poplar-bordered roads peculiar to France. We passed on to the dirty strip of wilderness which is the actual front. The battered villages and disorderly ruins looked like hieroglyphics traced on wet sand. A sea of smoke rolled over the ground for miles. It was a by-product of one of the most terrific bombardments in the history of trench warfare. Through it hundreds of gun-flashes twinkled, like the lights of a Chinese garden. 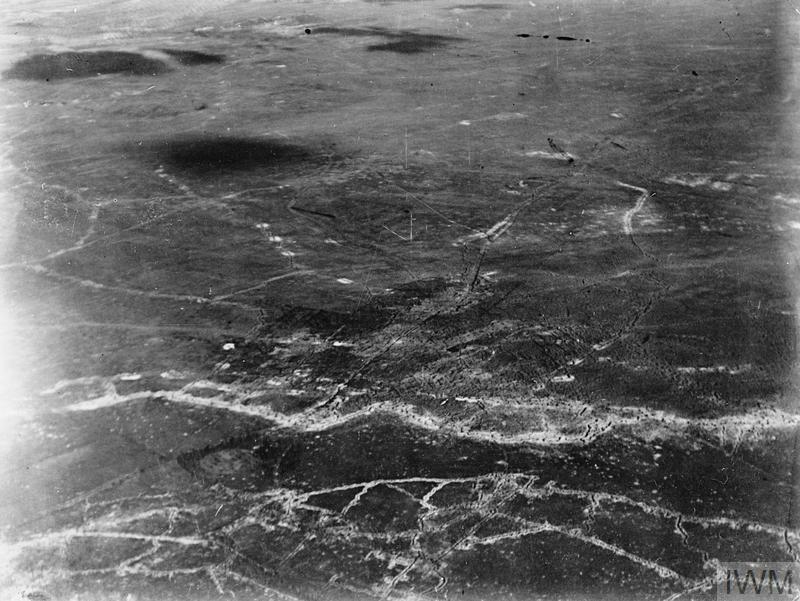 Having reached a height of 12,000 feet, we crossed the trenches south of Bapaume. As the danger that stray bullets might fall on friends no longer existed, pilots and observers fired a few rounds into space to make sure their guns were behaving properly. Archie began his frightfulness early. He concentrated on the leader’s machine, but the still-dim light spoiled his aim, and many of the bursts were dotted between the craft behind. I heard the customary ‘Wouff’! ‘Wouff!’ ‘Wouff!’ followed in one case by the ’S-s-s-s-s’ of passing fragments. We swerved and dodged to disconcert the gunners. After five minutes of hide-and-seek, we shook off this group of Archie batteries. The flight-commander headed for Mossy-Face Wood, scene of many air battles and bomb raids. 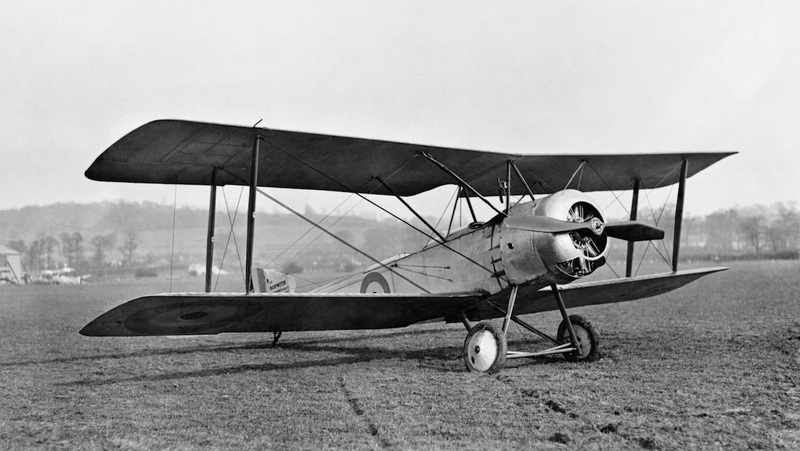 An aerodrome just east of the wood was the home of the Fokker star, Boelcke. C. led us to it, for it was his great ambition to account for Germany’s best pilot. While we approached, I looked down and saw eight machines with black Maltese crosses on their planes, about three thousand feet below. They had clipped wings of a peculiar whiteness, and they were ranged one above the other like the rungs of a Venetian blind. A cluster of small scouts swooped down from Heaven-knows-what height and hovered above us; but C. evidently did not see them, for he dived steeply on the Huns underneath, accompanied by the two machines nearest him. The other group of enemies then dived. I looked up and saw a narrow biplane, apparently a Roland, rushing towards our bus. My pilot turned vertically and then side-slipped to disconcert the Boche’s aim. The black-crossed craft swept over at a distance of less than a hundred yards. I raised my gun-mounting, sighted, and pressed the trigger. Three shots rattled off – and my Lewis gun ceased fire. Intensely annoyed at being cheated out of such a splendid target, I applied immediate action, pulled back the cocking-handle and pressed the trigger again. Nothing happened. After one more immediate action test, I examined the gun and found that an incoming cartridge and an empty case were jammed together in the breech. To remedy the stoppage, I had to remove the spade-grip and body cover. As I did this, I heard an ominous ta-ta-ta-ta-ta from the returning German scout. My pilot cart-wheeled round and made for the Hun, his gun spitting continuously through the propeller. The two machines raced at each other until less than fifty yards separated them. Then the Boche swayed, turned aside, and put his nose down. We dropped after him, with our front machine-gun still speaking. The Roland’s glide merged into a dive, and we imitated him. Suddenly a streak of flame came from his petrol tank, and the next second he was rushing earthwards, with two streamers of smoke trailing behind. I was unable to see the end of this vertical dive, for two more single-seaters were upon us. 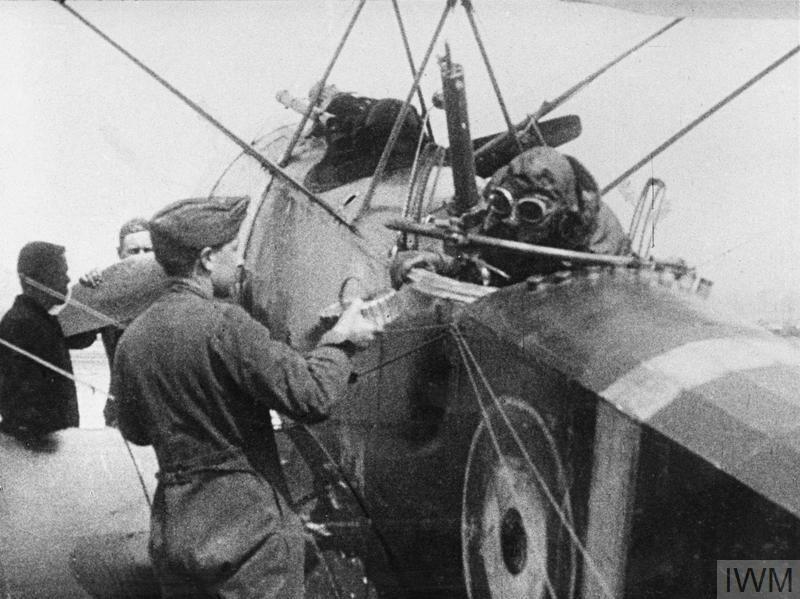 They plugged away while I remedied the stoppage, and several bullets ventilated the fuselage quite close to my cockpit. When my gun was itself again, I changed the drum of ammunition, and hastened to fire at the nearest Hun. He was evidently unprepared, for he turned and moved across our tail. As he did so, I raked his bus from stem to stem. I looked at him hopefully, for the range was very short and I expected to see him drop towards the ground at several miles a minute. He sailed on serenely. This is an annoying habit of enemy machines when one is sure that, by the rules of the game, they ought to be destroyed. The machine in question was probably hit, however, for it did not return, and I saw it begin a glide as though the pilot meant to land. We switched our attention to the remaining Hun, but this one was not anxious to fight alone. He dived a few hundred feet, with tail well up, looking for all the world like a trout when it drops back into water. Afterwards he flattened out and went east. During the fight we had become separated from the remainder of our party. I searched all round the compass, but could find neither friend nor foe. We returned to the aerodrome where hostile craft were first sighted. There was no sign of C.’s machine or of the others who dived on the first group of Huns. Several German machines were at rest in the aerodrome. Finding ourselves alone, we passed on towards the lines. I twisted my neck in every direction, for over enemy country only a constant look out above, below, and on all sides can save a machine from a surprise attack. After a few minutes we spotted six craft bearing towards us from a great height. Through field-glasses I was able to see their black crosses, and I fingered my machine gun expectantly. The strangers dived in two lots of three. I waited until the first three were within 300 yards’ range and opened fire. One of them swerved away, but the other two passed right under us. Something sang to the right and I found that part of a landing-wire was dangling helplessly from its socket. We thanked whatever gods there be that it was not a flying-wire, and turned to meet the next three Huns. We swerved violently, and they pulled out of their dive well away from us. With nose down and engine full out, we raced towards the lines and safety. Three of the attackers were unable to keep up with us and we left them behind. The other three Germans, classed by my pilot as Halberstadts, had a great deal more speed than ours. They did not attack at close quarters immediately, but flew 200 to 300 yards behind, ready to pounce at their own moment. Two of them got behind our tail-plane so that they were safe from my fire. The third was slightly above our height, and for his benefit I stood up and rattled through a whole ammunition drum. I don’t think I hit him, for he was not in difficulties. He dived below us to join his companions, possibly because he did not like being under fire when they were not. To my surprise and joy, he fell slick on one of the other two Hun machines. This latter broke into two pieces, which fell like stones. The machine responsible for my luck side-slipped, spun a little, recovered, and went down to land. The third made off to the east. In plain print and at a normal time, this episode shows little that is comic. But when it happened I was in a state of high tension, and this, combined with the startling realisation that a Hun pilot had saved me and destroyed his friend, seemed irresistibly comic. I cackled with laughter and was annoyed because my pilot did not see the joke. We reached the lines without further trouble from anything but Archie. The pink streaks of daybreak had now disappeared beneath the whole body of the sunrise, and the sky was of that intense blue which is the secret of France. What was left of the ground mist shimmered as it congealed in the sunlight. The pall of smoke from the guns had doubled in volume. The Ancre [River] sparkled brightly. We cruised around in a search for others of our party, but found none. A defensive patrol was operating between Albert and the trenches. We joined it for half an hour, at the end of which I heard a ‘Hallo!’ from the speaking-tube. ‘What’s up now?’ I asked. ‘Going to have a look at the war,’ was the pilot’s reply. 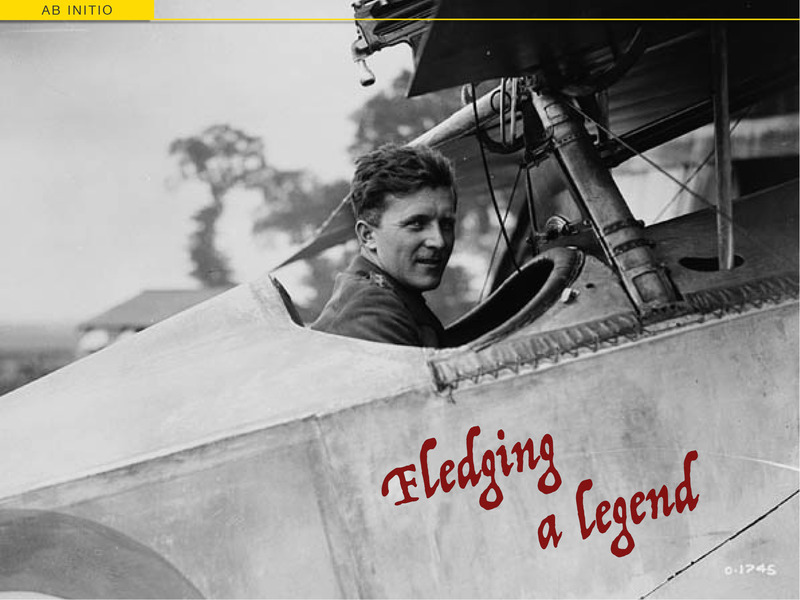 Before I grasped his meaning he had shut off the engine and we were gliding towards the trenches. At 1200 feet we switched on, flattened out, and looked for movement below. There was no infantry advance at the moment, but below Courcelette what seemed to be two ungainly masses of black slime were slithering over the ground. I rubbed my eyes and looked again. One of them actually crawled among the scrapheaps that fringed the ruins of the village. Only then did the thought that they might be tanks suggest itself. Afterwards I discovered that this was so. The machine rocked violently as a projectile hurtled by underneath us. The pilot remembered the broken landing wire and steered for home. After landing, we compared notes with others who had returned from the expedition. 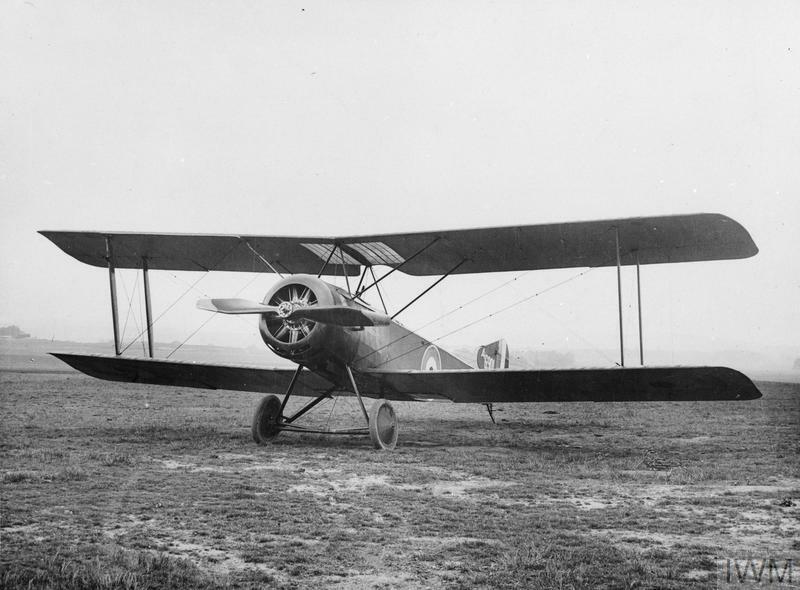 C, we learned, was down at last, after seventeen months of flying on active service, with only one break for any appreciable time. He destroyed one more enemy before the Boches got him. In the dive he got right ahead of the two machines that followed him. As these hurried to his assistance, they saw an enemy plane turn over, show a white, gleaming belly, and drop in zigzags. C.’s bus was then seen to heel over into a vertical dive and to plunge down, spinning rhythmically on its axis. Probably he was shot dead and fell over on to the joystick, which put the machine to its last dive. The petrol tank of the second machine to arrive among the Huns was plugged by a bullet, and the pilot was forced to land. Weeks later, his observer wrote us a letter from a prison camp in Hanover. The third bus, perforated by scores of bullet holes, got back to tell the tale. C. was one of the greatest pilots produced by the war. 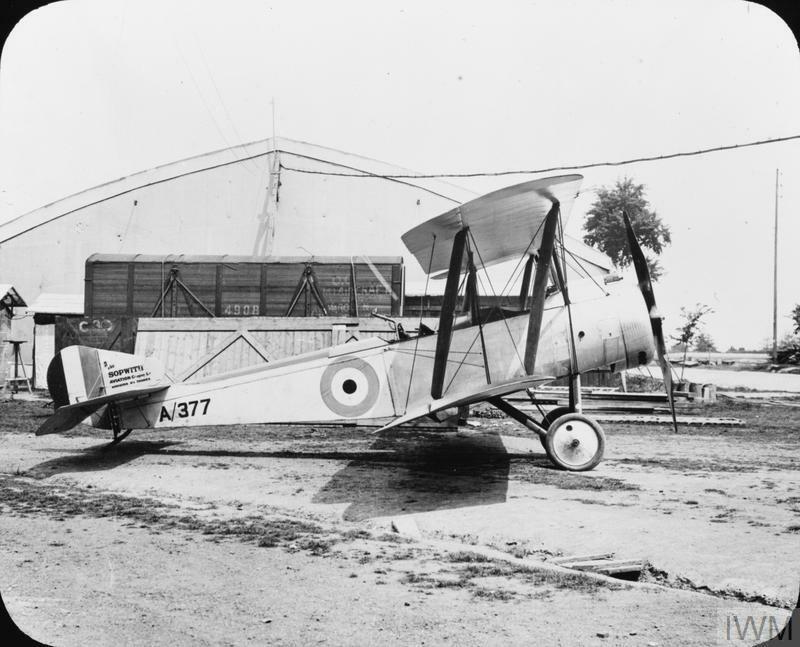 He was utterly fear- less, and had more time over the German lines to his credit than any one else in the Flying Corps. It was part of his fatalistic creed that Archie should never be dodged, and he would go calmly ahead when the AA guns were at their best. Somehow, the bursts never found him. 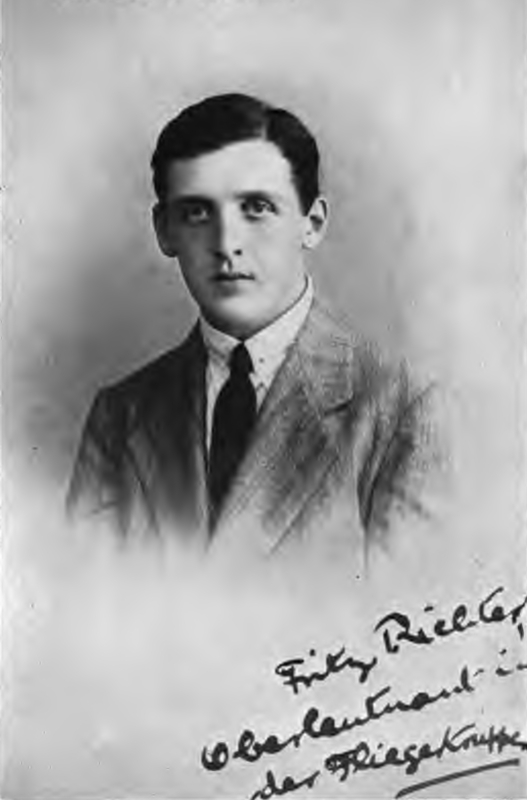 He had won both the DSO and the MC for deeds in the air. 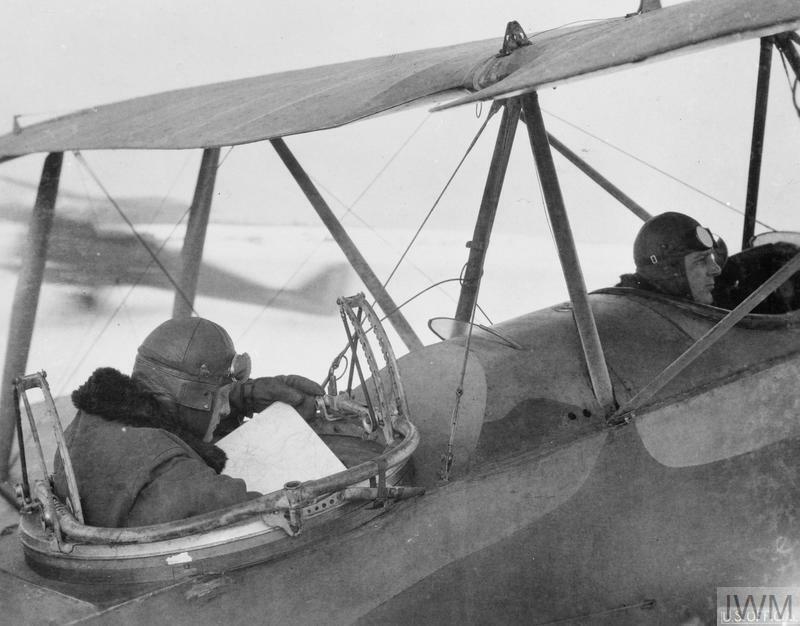 Only the evening before, when asked lightly if he was out for a VC, he said he would rather get Boelcke than the VC; and in the end Boelcke probably got him, for he fell over the famous German pilot’s aerodrome, and that day the German wireless announced that Boelcke had shot down two more machines. Peace to the ashes of a fine pilot and a very brave man! A bullet entered the large artery of his thigh. He bled profusely and lost consciousness in the middle of a fight with two Huns. When he came to, a few minutes later, he grabbed his gun and opened fire on an enemy. After about forty shots the chatter of the gun ceased, and through the speaking-tube a faint voice told the pilot to look round. The pilot did so and saw a Maltese-cross biplane falling in flames. But Uncle had faded into unconsciousness again, and he never came back. It is more than possible that if he had put a tourniquet round his thigh, instead of continuing the fight, he might have lived. A great death, you say? One of many such. Only the day before I had helped to lift the limp body of Paddy from the floor of an observer’s cockpit. He had been shot over the heart. He fainted, recovered his senses for ten minutes, and kept two Huns at bay until he died, by which time the trenches were reached. Imagine yourself under fire in an aeroplane at 10,000 feet. Imagine that only a second ago you were in the country of shadows. Imagine yourself feeling giddy and deadly sick from loss of blood. Imagine what is left of your consciousness to be stabbed insistently by a throbbing pain. Now imagine how you would force yourself in this condition to grasp a machine-gun in your numbed hand, pull back the cocking handle, take careful aim at a fast machine, allowing for deflection, and fire until you sink into death. Some day I hope to be allowed to visit Valhalla for half an hour, that I may congratulate Paddy and Uncle. We refreshed ourselves with cold baths and hot breakfast. In the mess the fights were reconstructed. Sudden silences were frequent – an unspoken tribute to C. and the other casualties. But at lunch-time we were cheered by the news that the first and second objectives had been reached, that Martinpuich, Courcelette, and Flers had fallen, and that the tanks had behaved well. After lunch I rested awhile before the long reconnaissance, due to start at three. Six machines were detailed for this job; though a faulty engine kept one of them on the ground. The observers marked the course on their maps, and wrote out lists of railway stations. At 3.30 we set off towards Arras. Archie hit out as soon as we crossed to his side of the front. He was especially dangerous that afternoon, as if determined to avenge the German defeat of the morning. Each bus in turn was encircled by black bursts, and each bus in turn lost height, swerved, or changed its course to defeat the gunner’s aim. A piece of HE hit our tailplane, and stayed there until I cut it out for a souvenir when we had returned. The observers were kept busy with notebook and pencil, for the train movement was far greater than average, and streaks of smoke courted attention on all the railways. Rolling stock was correspondingly small, and the counting of the trucks in the sidings was not difficult. Road and canal transport was plentiful. As evidence of the urgency of all this traffic, I remarked that no effort at concealment was made. On ordinary days, a German train always shut off steam when we approached; and I have often seen transport passing along the road one minute, and not passing along the road the next. On September 15 the traffic was too urgent for time to be lost by hide-and-seek. We passed several of our offensive patrols, each of whom escorted us while we were on their beat. It was curious that no activity could be noticed on the enemy aerodromes. Until we passed Mossy-Face on the last lap of the homeward journey we saw no Hun aircraft. Even there the machines with black crosses flew very low and did not attempt to offer battle. Nothing out of the ordinary happened until we were about to cross the trenches north of Peronne. Archie then scored an inner. One of his chunks swept the left aileron from the leader’s machine, which banked vertically, almost rolled over, and began to spin. For two thousand feet the irregular drop continued, and the observer gave up hope. Luckily for him, the pilot was not of the same mind, and managed to check the spin by juggling with his rudder controls. The bus flew home, left wing well down, with the observer leaning far out to the right to restore equilibrium while the icy rush of air boxed his ears. We landed, wrote our reports, and took them to headquarters. The day’s work had been done, which was all that mattered to any extent, and a very able general told us it was ‘dom good’. But many a day passed before we grew accustomed to the absence of Uncle and Paddy. And so to bed, until we were called for another early morning show. This extract is from The Day’s Work, chapter II of An Airman’s Outings, by RFC Lieutenant (later Captain) Alan Bott, MC. 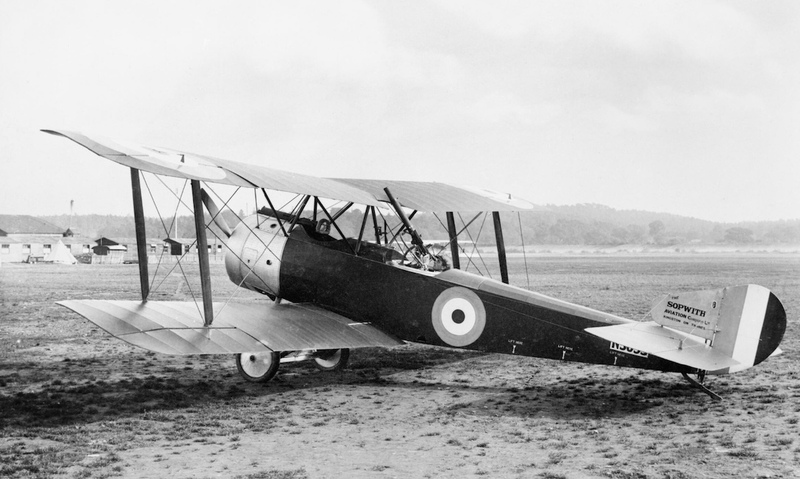 A former war correspondent and junior artillery officer, Bott transferred to the RFC and joined No.70 Squadron as an observer, flying Sopwith 1½ Strutters with the very experienced Lieutenant (later Major) Awdry Vaucour MC, DFC as his regular pilot. On September 15th the pair flew their regular Strutter, A892, and were credited with a Fokker Eindecker destroyed over Handricourt. That afternoon, Vaucour was appointed Flight Commander to replace Cruickshank, and promoted to Captain. 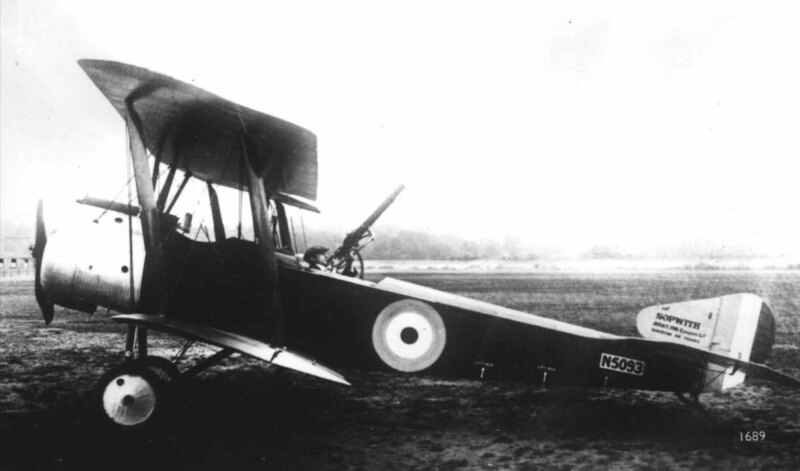 Bott went on to train as a pilot himself in the first half of 1917 and was then posted to No.111 Sqn. in the Sinai, where he increased his tally to become an ace. 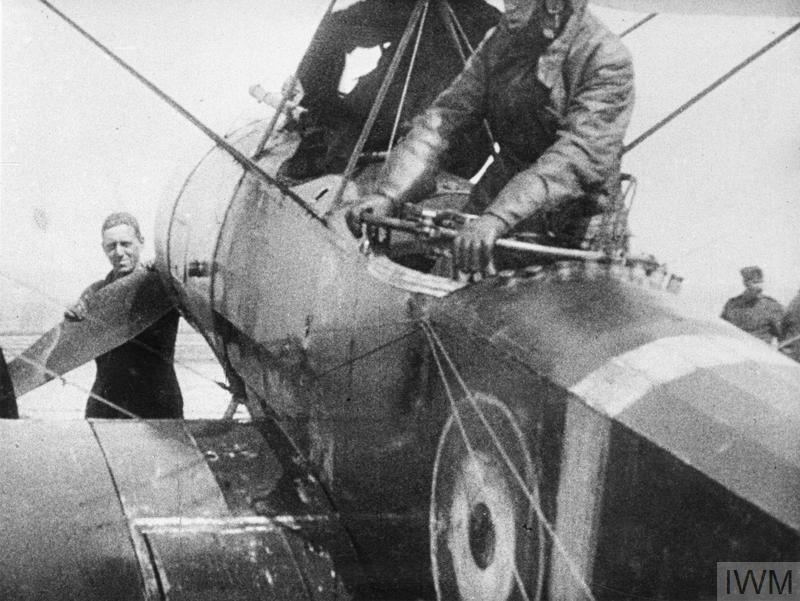 On April 22nd, 1918, he was shot down and taken prisoner by the Turks, but managed to escape. He had reached Greece via Ukraine and Bulgaria when the general armistice was declared on November 11th. 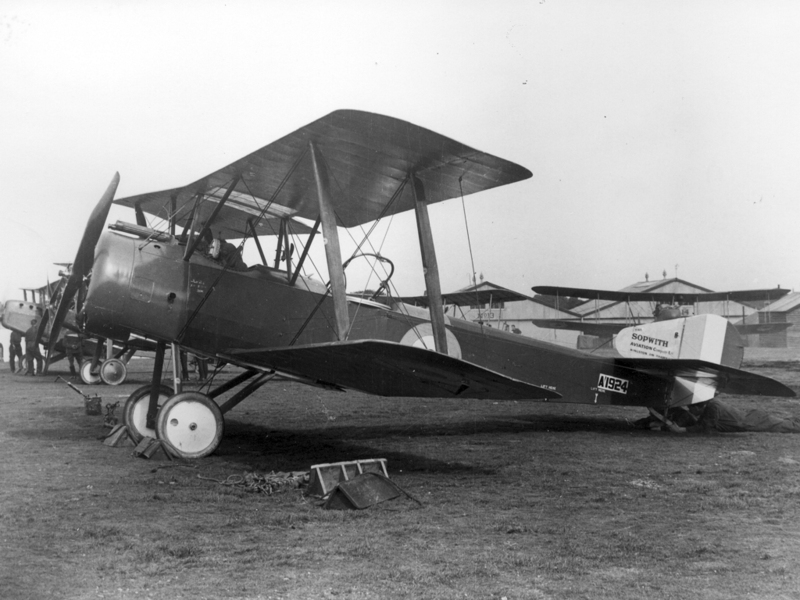 An Airman’s Outings was written during his 70.Sqn service in 1916 and published under the nom-de-plume ’Contact’ the following year. You can download a full copy for free here. This is a fascinating insight into the life of an RFC crew. The description of the air battles and the ground giving depth to the many history books that already cover this war. Yes, nothing beats a first-hand account. Bott has been criticised for his breezy, ‘ripping yarn’ style (it’s certainly more upbeat than Elliot White-Springs’ ‘War Birds’) but I don’t know; I’m prepared to believe it was the tone of that generation. These young men spent their teens in a Britain that was awash with money and Edwardian optimism. A good point. It certainly has that romanticised feel to it often associated with the views of the ‘tea drinking’ young men from those wealthier backgrounds. A little disjointed from the realities of the horrors on the ground below. Indeed – and to an extent they were removed from the horrors below. The air had its own horrors, including constant fear of a flaming death and the grinding fatigue of several patrols a day. The impact is painfully obvious in photos of WW1 airmen, but they hid it behind a stiff upper lip in their writing. Absolutely – as the war progressed this became evermore real and apparent. From the very beginning (and the mention of hot cocoa), I was riveted! I’ve just downloaded the full book. Yeah… There’s something about getting up at 4.15 that even a cup of hot cocoa can’t fix. Still, I’m glad I’ve helped you find another great aviation book. I’m sure you’ll love it.